Individuals with fragile X syndrome, the most common inherited form of intellectual disability, often develop epilepsy, but so far the underlying causes are unknown. Researchers have now discovered a potential mechanism that may contribute to the link between epilepsy and fragile X syndrome. 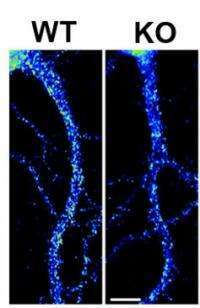 The protein that is missing in fragile X syndrome, FMRP, controls the production of a protein that regulates electrical signals in brain cells, scientists at Emory University School of Medicine have found. The results were published April 13 in the Journal of Neuroscience. Individuals with fragile X syndrome tend to have a hyperexcitable nervous system, which can be displayed in several ways: hyperactivity, anxiety, increased sensory sensitivity, and epileptic seizures in 20 percent of all cases. The Emory team's findings suggest that a therapeutic strategy against fragile X syndrome now being tested in clinical trials could also address this aspect of the disease. "The link between fragile X syndrome and epilepsy was not well understood," says senior author Gary Bassell, PhD, professor of cell biology and neurology at Emory University School of Medicine. "This finding might provide a molecular explanation that could also give some clues on therapeutic strategies." The co-first authors of the paper are postdoctoral fellow Christina Gross and PhD candidate Xiaodi Yao. They and their colleagues found that in mice missing FMRP  a model for humans with fragile X syndrome  brain cells produce less of a protein called Kv4.2. FMRP is known to regulate several genes, and it's possible that changes in others besides Kv4.2 contribute to the development of epilepsy. For many of the genes that FMRP controls, it normally acts as a brake, by interfering with the step in which RNA is made into protein. In FMRP's absence, this leads to runaway protein production at synapses the junctions between brain cells where chemical communication occurs. Kv4.2 appears to be an exception, because in FMRP's absence, less Kv4.2 protein is produced. The protein Kv4.2 is an ion channel, which allows electrical charge to flow out of neurons when they are stimulated. Kv4.2 is the major ion channel regulating the excitability of neurons in the hippocampus, a region of the brain important for learning and memory. A mutation of the gene encoding Kv4.2 leads to temporal lobe epilepsy in humans. In laboratory tests, drugs that tamp down glutamate signaling could partially restore levels of the Kv4.2 protein in mice missing the fragile X protein. This suggests that drugs that act against glutamate signaling, which are now in clinical trials, could reduce hyperexcitability in humans with fragile X syndrome. Another strategy could be to identify drugs that target the Kv4.2 protein's function directly, Bassell says. Not all individuals with fragile X syndrome develop epilepsy. The loss of FMRP doesn't shut Kv4.2 production off completely, and other genetic variations and environmental factors probably contribute to the development of epilepsy in individuals with fragile X syndrome, Bassell says.